If you have ever visited our Phoenix periodontist office, you have probably seen brochures or pamphlets about gum disease. We do our best to educate our patients about the dangers of gum disease in order to prevent it from occurring. But when our patients begin to see the first signs of gum disease, what should they do about it? 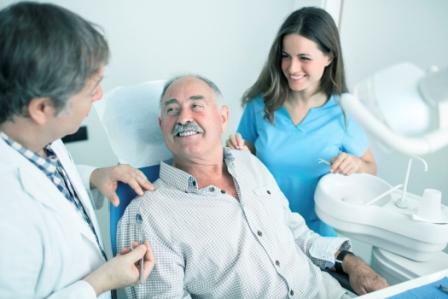 The first thing you should do if you feel you may be at risk of developing gum disease is to make an appointment with the Arizona Periodontal Group. Here, we can examine your gum tissue and note any redness, swelling or bleeding. We will also measure your gum line to look for any pocketing between the teeth and gums. If you are found to be developing gum disease, we may recommend LANAP treatment. Laser-Assisted New Attachment Procedure is a breakthrough way to treat gum disease. With this proven, FDA-approved technology, we are able to avoid the more invasive surgical techniques that are traditionally used for gum disease treatment in Phoenix. With LANAP you can be treated in as little as two visits, and be rapidly on your way to a healthy recovery. The specialized laser used in LANAP therapy is really quite remarkable. It affects only bacteria and diseased tissue, while leaving healthy tissue untouched. This means that you will experience a faster recovery time since no healthy tissue is damaged in the process. The laser gently removes the harmful bacteria that might be residing in any pockets you have developed, and then encourages the gums to adhere to the teeth where they belong. The procedure is quick and requires only a local anesthetic to help our patients to be totally comfortable. If you suspect you might be developing gum disease, or if you want to learn more about the procedure, give us a call to schedule a consultation. Dr Trujillo is certified and experienced in LANAP and can help you to decide whether or not it would be in your best interest to receive it. As a premier periodontist in Phoenix, he has the credentials and skills it takes to treat your gums and teeth with all of the efficient care you seek. Make an appointment today!